FIBER OPTICS TECHNICIAN'S MANUAL, 4E is the ideal practical guide for designers, installers, and troubleshooters of fiber optic cable plants and networks. It reflects recent changes in fiber optic technology, marketing, and applications, including wider usage of Fiber To The Home (FTTH) applications and Local Area Networks (LANs). 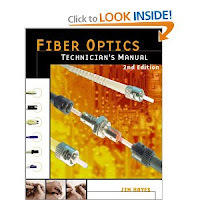 This book begins with a brief history of the development of fiber optics and progresses from the basics of this technology and its components, to installation and testing. FIBER OPTICS TECHNICIAN'S MANUAL, 4E will provide readers with a comprehensive overview of all aspects of fiber optics as used in communications systems, including telephone, CATV, and computers. Jim Hayes is a founder and President of The Fiber Optic Association, the professional society for fiber optics. He is also a partner in VDV Works, a company that provides tech support to the voice-data-video industry in the form of marketing, training and technical content for websites, literature or newsletters and other technical assistance services. Originally educated as a physicist and astronomer at Vanderbilt University and The University of California at Santa Cruz, Jim has been involved with the electronics and test instrumentation industry since 1968. For the last 25 years, he has been involved with fiber optics and communications. Jim was founder and President of Fotec, Inc., the Boston-based fiber optic test equipment company which was sold to Fluke Networks in 2001. He started the Fiber U and Cable U training conferences. Jim is a frequent lecturer on communications, writes monthly columns for Electrical Contractor and TED (The Electrical Distributor) and is the author of two VDV books, The Fiber Optic Technicians Manual and Data, Voice and Video Cabling and numerous articles on fiber optics and cabling. --This text refers to an out of print or unavailable edition of this title. CLICK ON THIS FREE EBOOK DOWNLOAD LINK!! !